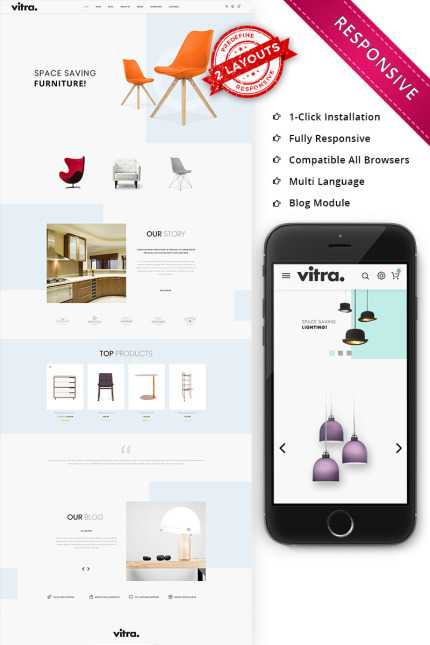 Vitra Multipurpose Woocommerce Template is fully responsive designed for Furniture and Lighting, tools with two different elegant designs. It has admin panel that manage to control store easily. This Template provides one click demo installation available that setup your store within few minutes. You can set amazing slide image with Revolution slider. More over You can used this template for other ecommerce store like electronics, computers, fashion, furniture, accessories, food, apparel, cloths, kitchen, jewelry, tools, medicine, mega, minimal and multipurpose stores.